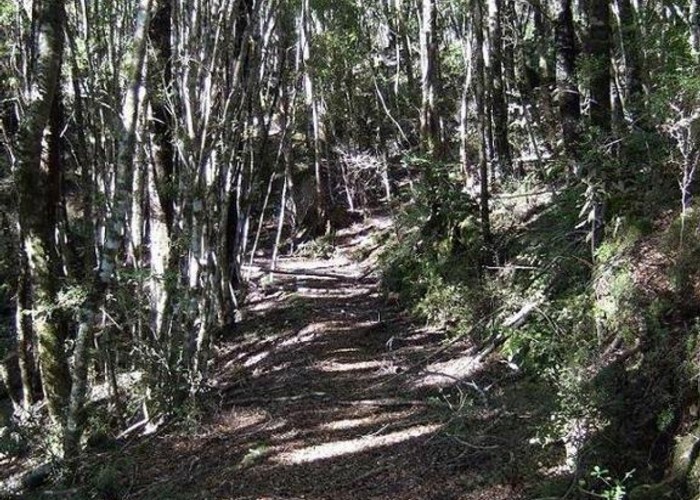 This pic shows a section of the old miners track that leaves the Big River Road at c. NZTM2000 E1508454 N5328096 and can take you as per Matthews Route Guide description into a headwater tributary of Rainy Creek. From the Big River Road it starts as a 4x4 track then it becomes a walking track after a fairly short distance. Parts of the track are in good condition such as the section photographed but other bits are covered in windfalls, may have slipped away or have regrowth vegetation on the track. A section through the "new" Souvenir pit, one of OceanaGold's mines is closed & needs to be bypassed to the south then the track picked up again. Due to blasting there is a 300m exclusion zone from the pit perimeter. *see sidebar comments. Within close proximity to the track that leads from the Big River Road to SH7 where Rainy Creek joins the Inangahua River there is a wealth of history associated with the gold, coal & sawmilling industries. Tracks, tramways, aerial tramways, etc. glennj Active mining has long finished at the Souvenir pit site and rehabilitation has finished. The pit has been filled and capped and the site planted. To get from the Big River 4x4 road near Merrijigs out to the Inangahua River via Rainy Creek is still possible. The old tracks are overgrown and there are patches of windfall. This route is only for trampers with good bush skills! glennj A shorter & less arduous walk from the Big River road than the one thru to SH7 via Rainy Creek is the loop walk from Alborns carpark. This carpark is 9km up the Big River road & can be driven to in a two wheel drive vehicle unlike the start of the other track where a 4x4 is required if you want to drive to the track start. On the Alborns track which is fully maintained by DOC you can see lots of relics from the coal mining industry plus get glimpses of some of OceanaGold's current mining operations. glennj There have been fairly recent reported hearings & sightings of the SI Kokako in the Rainy Creek area. I haven't seen one there yet but have been surprised by the high frequency of sightings & hearing of Kaka in this general area. Added 30 August 2011 by glennjglennj. 4 revisions, most recently 1 August 2018 by glennjglennj.